What you should know about the LASEK surgery abroad? How long should I stay abroad for my surgery? The standard schedule of patient’s stay abroad for a surgery in general anaesthesia requires only 7 days! Before the arrival, patients should send us any tests’ results and all the information that they have concerning their medical problems. In the case of orthopaedic surgeries, rehabilitation might be required after the surgery. Why should I decide to have knee arthroscopy performed? In the case when joint injuries or diseases occur, the pain begins to limit the mobility of the patient and thus the comfort of his life is worse. One of the most disturbing joints, causeing much trouble is the knee joint. The ends of bones are covered with cartilages and synovium, which eliminate friction. However, sometimes the friction occurs causing joint pain, which often leads to the necessity of a surgery, such as knee arthroscopy. The most common cause is the degenerative joint disease. How is the knee arthroscopy performed? 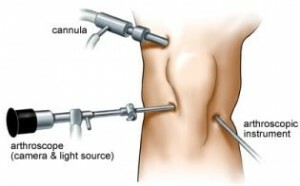 Arthroscopy is performed in the operating room under local or general anesthesia. It involves the introduction of a device called the arthroscope into the joint through a small incision in the area of ​​the pond. After the introduction, the saline solution is injected into the pond, making it easier to watch the inside of the joint. Then the doctor evaluates all the structure in the joint. This part is called an diagnostic arthroscopy. Then the doctor can enter various miniature surgical instruments in order to perform medical procedures inside the joint. In this case we talk about surgical (therapeutic) arthroscopy. What are the indications for knee arthroscopy? Is the procedure performed only for diagnostic purposes? The arthroscopy of joints serves in both diagnostic and therapeutic cases. During the operation, in addition to a thorough evaluation of the joint, the surgeon can perform a number of activities which aim to prevent / reduce the discomfort associated with damage to the internal structures of the knee. It is possible to remove a fragment/ sew a damaged meniscus, cleaning / drilling in the cartilage damage, cut out adhesions / intra folds, as well as other corrections and reconstructions. What are the possible complications after knee arthroscopy? Although arthroscopy is a safe and minimally invasive surgical procedure, it is not free from complications or problems. Complications are events potentially affecting the overall health in a temporary or permanent way, which may require additional medical intervention. Complications after arthroscopic surgery are rare, but even if they happen, in majority of complications, doctors manage to successfully cure them. Please consult a doctor in the case of any leakage from the wound, significant redness and knee pain, bleeding, fever, shortness of breath, severe weakness, dizziness, chest pain, calf pain or other ill effects. Some issues after the surgery, although sometimes seen as a complication, are not dangerous from a medical point of view, and usually do not require additional treatment. These include nausea and vomiting, headache, malaise, drowsiness, temporary numbness around the joint, sustained moderate pain and swelling of the joint. A common problem encountered after arthroscopic knee joint procedure is the joint hematoma, requiring removal. Can I cure all my knee problems via arthroscopy? In the case of significant joint damage, arthroscopy alone is sometimes not enough to get the optimum results – then you may need further treatment, including a surgery. The prices stated are estimates taken based on todays exchange rates of GBP and EUR. Upon dental consultation an exact quote will be given taking into consideration all details of the patients treatment. The destination where you choose to receive your treatment may affect the overall cost of your treatment. Knee arthroscopy surgery lasts from half to one and a half hours, depending on the type of the disease, and the scope of the procedure. After the surgery, the incisions are stitched and closed by means of special dressin. Follow the doctor’s instructions and protect the dressing from getting wet. Unless your doctor tells the otherwise, you can load the operated knee immediately after the surgery. Rehabilitation is often recommended. Returning to work is possible after 2 – 3 weeks. A more active lifestyle can be implemented after 4 – 6 weeks – usually much time is needed to recover full fitness. Driving is possible only after regaining full control of the movement in the joint.